So I figure I can talk about the traveling part of the trip now. I have never traveled so far in such a short amount of time. This trip was literally for the event only. Here dad and I are on our way and we (or at least me), are wired with adrenaline. You couldn't get me to sleep no matter how hard you tried. I was seriously worried about the bags that get under my eyes after no sleep, but that didn't phase my body to just stay extremely nervous and alert until the taping of the show was over. What a nice lady we sat with on the airplane, Sandy. 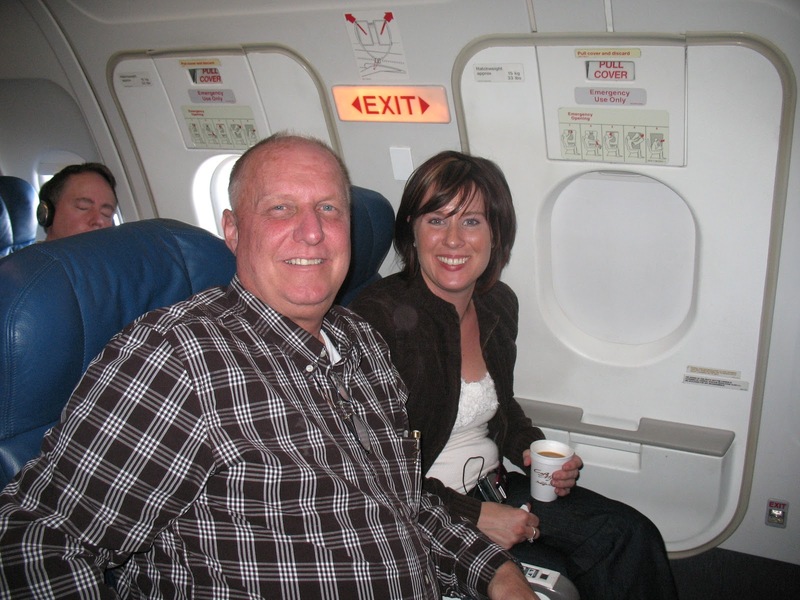 She took our picture here in the plane and also took the oath with us that "yes" we will assist in the exiting off the plane if such an emergency were to occur. So when we got off the plane we hopped into a black sedan waiting for us at the airport to take us to the hotel. What traffic there is in New York City! Sheesh, little town girl from Lodi cannot relate. What a comfortable car though, we asked the driver a lot about himself and looked at all the sights we could see. And what are the chances I will ever be in front of a subway entrance ever again? You never know so we took a picture. That was right after we got to the hotel put our stuff in the room and headed out to find something to eat. I was so tired and actually fell asleep for a few hours that night, but woke up at 3am with the nervous anxiety all over again. I did keep thinking though, I know that Nate Berkus is not nervous right now and HE IS THE SHOW! Why am I so nervous. But you couldn't tell that to my nervous nerves! What a relief when the taping was all over. I can't wait to tell you all about it! Hey my fellow followers! 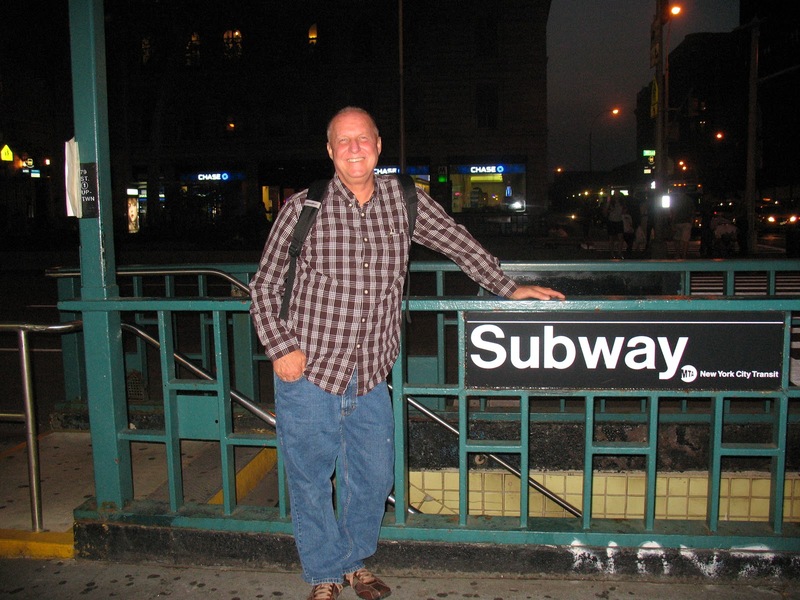 Here is the deal, I cannot blog about my trip to (the show), or what happened until it airs. I am so sorry about that. It was a quick trip literally 24hours there and back. I am so excited for all of you to see it air and as soon as I know the date it airs I will let you know beforehand. Thanks to all of you for following! All I know right now is I am going to need A LOT of caffeine to keep me going to make all the butcher blocks I am going to have to make. If you guys have any suggestions on how to keep yourselves awake let me know! interviewed today by the "sassy ladies" blog talk radio show! 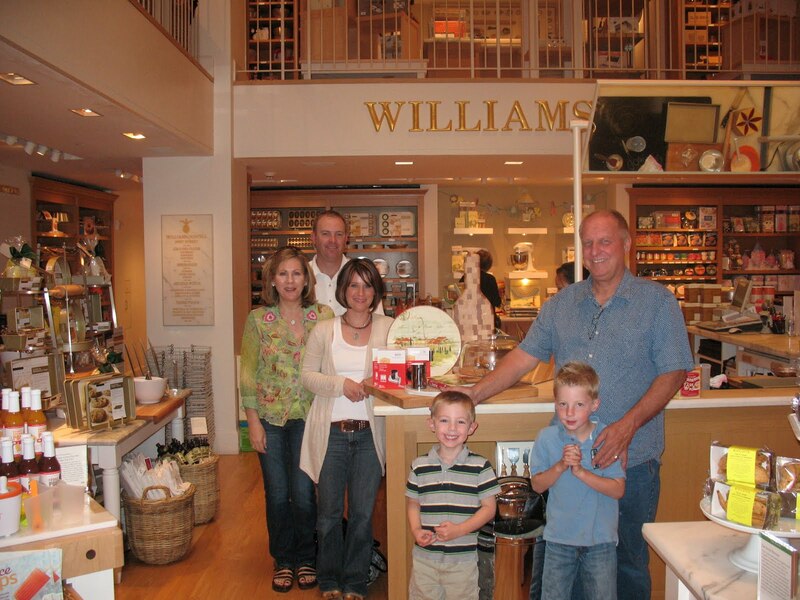 So this is dad and I so proud of the wine bottle on display in the Williams-Sonoma store. This was my FIRST time in a Williams-Sonoma store and I was so impressed. What a beautiful store! There are associates around every corner waiting to help you and give you information on any product. They know their stuff. This is what makes this store stand out above all the others, the quality of their products and the quality of their staff. Unbelievable excellence. I am so proud to have the ability to make a product that is worthy to be in their store! This is the entire family, Mom, Dad, Greg, Nathan & Jakob! My boys couldn't wait to touch everything in the store. I kept saying, "keep your hands in your pockets!" Then I remembered when I heard that last, my dad was saying that to me all the time in stores when I was a kid! Funny how things just don't change. I am definitely not going to listen to Mr. Know-It-All anymore. He kept saying; "did you blog about it yet?" Like 20 minutes after I found out on Saturday! One day after I blog about the trip and the plans have been changed, they are bumping it up for a week possibly two. So I am not going to New York tomorrow. I am half relieved because I have more time to get ready, and half disappointed because I was looking forward to it being this week. I will not say anymore about it until I have a plane ticket in my hand though. Thank you all for your support and I will let you know just as soon as I know! Ok I have been waiting to write this for almost two weeks but I couldn't until I knew it was official. After the wonderful journalist Lisa Johnson Mandell posted my story on AOL I got a phone call from a producer of "The Nate Berkus Show." She asked me about my story and asked if I would be interested in being on the show. Well am I stupid? I think not! Of course I want to be on the show! But, I didn't have an official notice till yesterday when she called and asked if I would be available on Friday for a taping! Is this crazy or what? I cannot believe all that has happened lately and I am in complete shock! I am so thankful for God's blessings and his faithfulness to get me through it all. All the nights I went home and told my husband; "I just don't think we are going to make it" and I would break down I don't know how many times. And he just said, "you keep your head up, and you keep going, you're going to make it." Without my husbands support I would have had a harder time going through all of the doubts and trials. 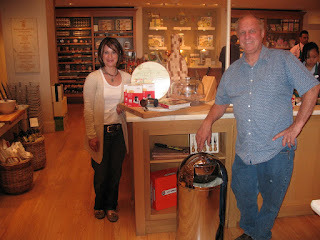 The president of Williams-Sonoma believed in our chopping block and how well it was made and now others are seeing it too! It just validates why I said I would not quit to those who told me to close the doors. My dad kept saying; "I don't see God wanting me to leave cabinet making, he keeps providing us with work to do and just what we need." Thank you Jesus for your faithfulness and for teaching me to trust in you completely, (although I am still in the big time learning stages with that). 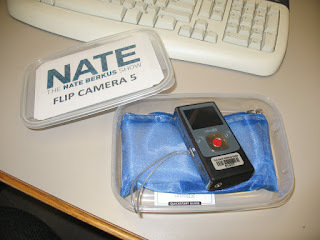 Well I fly out Thursday to be in New York, where I have never been, and then to tape the show Friday with Nate Berkus! I am so excited I can hardly stand it and I cannot believe I am actually typing all this. Life is full of surprises! I will clue you in to all the details as soon as I know! i want to get out of bed! I felt sick yesterday on my way to work and when I was dropping my son Nathan off at my Mom's my stomach started to twirl and you know the rest. Well I felt better and thought I can go to work no problem, and I was scheduled to be interviewed on this radio show from a really nice enterprneur lady in Oakland, California. I made it on the phone and just 1 minute before it was going to start I had to cancel the whole thing and run to the bathroom. Only to come out of the bathroom with two potential clients waiting for me to help them. Thank goodness for my dad, I got to go home and get sick some more by myself and be bored out of my mind. I am just such a busy worker bee and I really hate sitting in bed trying to regain energy. Every time I get sick I realize just how good I had it (for I don't know) the last year of my life of not being sick. As we humans do, we forget and go through our routines of feeling good and not skipping a beat. And every time I am sick I want to say, "remember this" be grateful when you feel good because it is so much better than this. I just can't say enough how things are starting to change all around me. The shop is getting busier with work and God blesses with every obstacle, and I am still here. I am so thankful for my family and my life and what Jesus has in store. What a blessing to be a witness for him and get his comfort in our times of trials. Thank you all for following. Some exciting news to come!